Make lemonade, pizza sauce, and pizza dough from scratch. 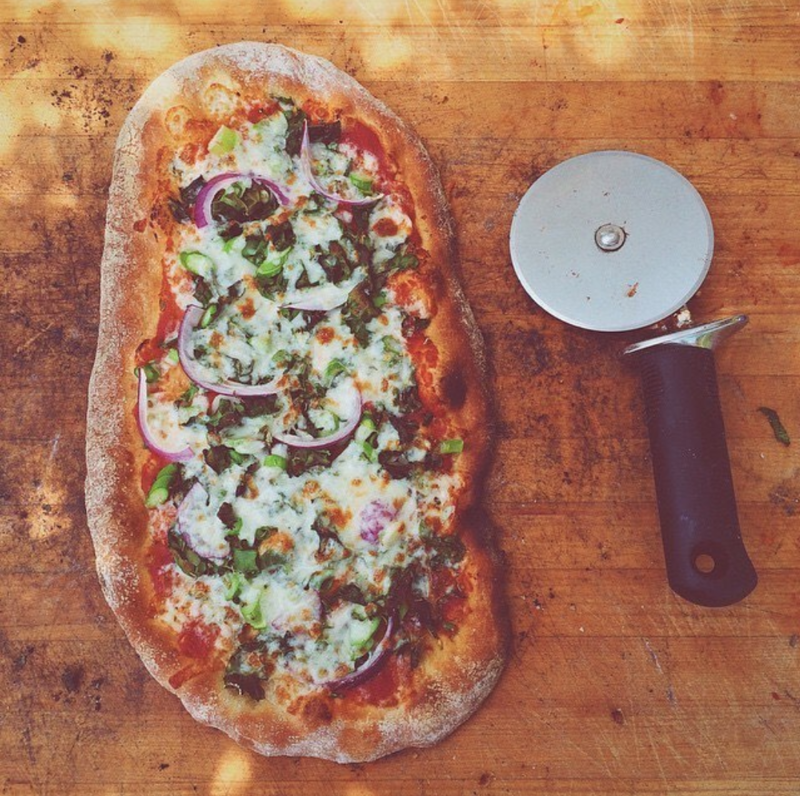 Form dough and build a pizza with sauce, cheese, and toppings. Discuss their experiences of baking pizza in a wood-fired oven and eating it in the ESY garden with their teachers and classmates. Make pizza sauce, pizza dough, lemonade, and prep pizza toppings. Form their dough and build a pizza with sauce, cheese, and toppings. Watch their pizza bake in the wood-fired oven and eat it in the ESY garden with their teachers and classmates. Collect all materials and build a fire in the wood-fired oven (it takes about 90 minutes to fully warm the ESY oven). Make Pizza Dough for the first class. Collect all materials and set up the Pizza Building Station and Pizza Building Station Side Table. Collect all materials and set up the Eating Station. Collect all materials and set up the Dough Station. Collect all materials and set up the Grain Grinding Station. Collect all materials and set up the Lemonade Station. Collect all materials and set up the Toppings Station. Welcome students and explain that today they will work together to celebrate their last day in the Edible Schoolyard with pizza and lemonade. Explain that today’s four working groups are all devoted to tasks to prepare for eating pizza, and that working groups will rotate through the Pizza Building Station where, in teams of two, students will have the opportunity to form their pizza dough and build it with sauce, cheese and toppings. Dough: Students “pay it forward” by making dough in the kitchen classroom for later classes. Grain grinding: Students use a variety of methods to grind wheat to use in the pizza dough. Lemonade: Students make lemonade at the outdoor kitchen and keep the Eating Station supplied with it. Toppings: Students harvest crops from the garden, wash them, and prep them for use at the Pizza Building Station. Pizza Work Rotation: Each group rotates through the Pizza Building Station as the other groups work in the kitchen classroom, outdoor kitchen and garden. The Dough group starts at the Pizza Building Station, where in groups of two they will assemble a pizza. When the first group finishes baking their pizzas, they may sit down at the Eating Station to eat. When the bell rings, the next group proceeds to the Hand Washing Station and then to the Pizza Building Station. It will take a total of 80 minutes to rotate all groups through the Pizza Building Station and Pizza Eating Station. After each group’s Pizza Work Rotation is complete, students may relax in the garden or visit the chickens. Demonstrate how to pull the dough on a pizza peel and add toppings, making sure to emphasize using enough flour to ensure adequate “scootch” (the dough’s ability to move independent of the peel, so that it will slide off into the oven). Give a ball of dough to each team of two students and have them assemble their pizza. Bake each pizza in the wood-fired oven. When pizzas are done, students proceed to the Eating Station, eat their pizza, and drink lemonade. Thank students for helping make the pizza celebration a success. Ask students to participate in one final Whip Around and share their favorite experience in the garden over their three years in middle school.